Now that Christmas is over and we're all receiving our January 'greetings' from credit card companies I thought I'd try put a smile back on my own face (and hopeful yours) by reflecting on something a little more joyous - Graduation Ceremonies. Ever since my own graduation back in the dim and distant past, I have loved the pomp, the ceremony, and the tradition of graduations, and have been lucky to attend many, either those of family and friends, or through working at a University for many years. It’s a time when there are beaming smiles and tears of joy – and that’s just from the staff – as the class of 2016 get to dress up like Harry Potter, attempt to walk across a stage in front of hundreds of people whilst wearing a mortar board, and see who can get the best selfie with the Vice-Chancellor. So how do Universities in the UK ensure that the day goes smoothly for the graduand and their family and friends? And how do they celebrate and share the events with the world? These tend to have two purposes – to make sure that everyone gets to their events on time, ideally wearing their graduation gown, but also to share photos and videos of the events before, during and after the ceremonies. As anyone who has worked behind the scenes of graduation will know, the days are run like a military operation. Schedules within schedules to make sure that everyone is where they should be when they should be (staff, graduands, visitors, VIPs, press, photographers, catering, school choirs…), often with multiple ceremonies running over one day. But the most important people of the day are the graduands and their families and friends (some of whom have travelled thousands of miles to join in the celebrations), and so the day for them needs to be seamless despite the backstage shenanigans – which means giving them a lot of information in the run up to the event, to ensure that their schedule runs to time and isn’t stressful or annoying. I recently attending a friend’s graduation, and the number of different places we had to visit on the day would make any FitBit wearer happy, but we knew exactly where we had to be and when and so the extra steps were worth it – especially as we got a mince pie! Another one from my alma mater – Bradford! I defy you to watch this and not smile! This is a great time lapse video – a graduation ceremony in around about 90 seconds! A touch of fun from their graduation photobooth! I love Storify – it can really bring an event to life and Guildhall have done just that. I’m off to dig out my graduation pics and laugh at the strange 90s dress sense! 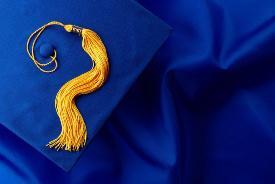 Send in your own graduations ‘best in class’, or pics from your own graduation, and we will share them.